Its smooth, rich, creamy taste has made it appear on the menu of VIP parties. Badam phirnis are a hit with visiting international dignitories. Here’s how you can make it in a jiffy at home. 1. Soak rice in water for few hours, then drain water and grind rice into a smooth paste. 2. In a non-stick saucepan bring milk. 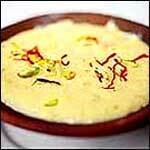 Over a moderatly low heat add rice, sugar and cardamom and stir constantly till milk turns thick. 3. Remove from heat and add almonds. 4. Put in serving bowl and chill. 5. Garnish with silver or gold foil paper (varak) and serve.